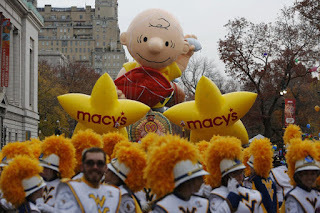 Amy's Daily Dose: How much does a float in Macy's Thanksgiving Day Parade cost? How much does a float in Macy's Thanksgiving Day Parade cost? Annual costs for parade float supplies, float decorations, property taxes and staff salaries total $2.7 million to $4.5 million. The sheer magnitude of the Macy's parade is overwhelming, and so are the assets associated with the event. Macy's also has its own studio space and a massive supply of costumes to prepare for the parade. Those assets are worth $8.9 million. Combine the parade's total annual expenses with its total assets and the price tag reaches $10.4 million to $12.3 million.